Internet has created more millionaires than anything else in the past 50 years! Ever since the Internet phenomenon, a lot of common folks have turned to home business. This eBook will be an eye opener! The advantages of working from home ,Top 10 home E-businesses of the millennium 15 Free eBooks,11 Free smallbiz Software downloads. Exclusive chapter on Building a Free AD-Machine and get 1000 Hits a day! Free Branding with clickbank ID! Free customization with your Website/URL! 20000 Leagues Under The Sea, by Jules Verne. The story of Captain Nemo and his incredible underwater machine, the Nautilus. A submarine of considerable modern content (mysterious secret power plants, able to sustain underwater travel for extraordinarily long periods of time, complete living quarters, etc. ), the Nautilus is Nemo's chief weapon in the war against Slave's plying the African nations for their trade. These two books, 3 Secrets to a Woman's Heart and 3 Secrets to a Man's Heart, divulge the secrets of the LOVE Relationship and what it takes to get that special someone in your life. It's not about what they like it's about what attracts them and what they respond to. Knowledge is the key to success and these books give you the knowledge you need to get and keep that special someone in your life. Truth about Men Women - Relationship Advice - These two e-books, 3 Secrets to a Woman's/Man's Heart, divulge the secrets of the LOVE Relationship and what it takes to get that special someone in your life. It's not about what they like it's about what attracts them and what they respond to. You won't need love poems or greeting cards to help you, as you will have the knowledge and knowledge is the key to success. 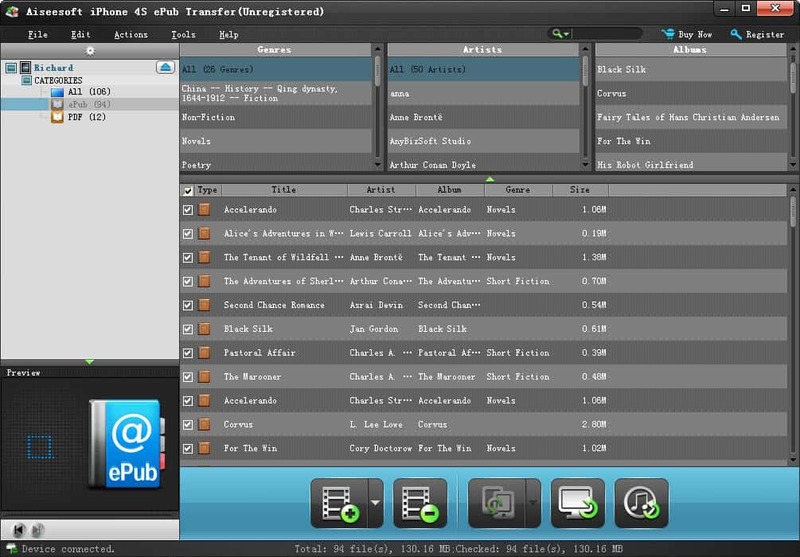 4Easysoft ePub to iPad Transfer is a new desktop application to transfer ePub to iPad or ePub from iPad. With powerful functions, it can easily help users transfer ePub files to iPad directly or export some ePub format contents in your iPad out to some other storage devices. Furthermore, the operation steps are very simple, and the interface is user-friendly and intuitive, all of which help users easily use it. Moreover, 4Easysoft ePub to iPad Transfer is able to copy iPad ePub files to computer with the original quality. key features 1.Transfer ePub files to iPad With ePub to iPad Transfer, you can smoothly transfer ePub to iPad directly without iTunes. 2.Export ePub files from iPad This ePub to iPad Transfer can help users export ePub files from iPad to computer for backup. 3.Good compatibility This ePub to iPad Transfer can work well on iPad, iPhone and iPod touch devices. 4.Quick search With this ePub to iPad Transfer, you can easily filter your desired ePub file by the category of Genre, Album and Artist. A Christmas Carol freeware electronic book in Windows 95/98/NT help format. Contains the full text along with added art and an annotated table of contents for quick access to specific portions of the story. A Tale of Two Cities, by Charles Dickens. British barrister Sydney Carton lives an insubstantial and unhappy life. He falls under the spell of Lucie Manette, but Lucie marries Charles Darnay. When Darnay goes to Paris to rescue an imprisoned family retainer, he becomes entangled in the snares of the brutal French Revolution and is himself jailed and condemned to the guillotine. Everyone with acne - prone skin could benefit from this free guide. As acne is a common skin disease, it is very important to know the facts about prevention, main causes and how to deal with the issue. No painful procedures, no prescriptions. Just 100% natural, easy-to make homemade remedies. A great source of information on the most common skin disease. Aiseesoft PDF to ePub Converter provides powerful and professional functions. With Aiseesoft PDF to ePub Converter, you can convert your PDF files to ePub file easily and quickly. So you can read eBooks more easily on your iPad, iPhone, iPod Touch, Sony Reader or other eBook Readers. In addition, Aiseesoft PDF to ePub Converter supports batch conversion, very simple settings. The user-friendly interface of Aiseesoft PDF to ePub Converter makes the operation quite easy for both beginners and advanced users. Download Aiseesoft PDF to ePub Converter to experience more colorful multimedia life. Key Functions 1.Convert eBooks from PDF to ePub format Aiseesoft PDF to ePub Converter allows you to convert your PDF files to ePub file easily and quickly. 2.Batch Conversion Mode You can import many PDF eBooks to the program and convert them to EPUB eBooks at one time. 3.Support customizing output font color, background color, etc. 4.Parsing PDF file include all text, image. 5.Easy to use The user-friendly interface of Aiseesoft PDF to ePub Converter makes the operation quite easy for both beginners and advanced users. After a few clicks, this magic software will do the rest work for you. 6.Fastest Conversion Speed Super fast speed and excellent output quality.